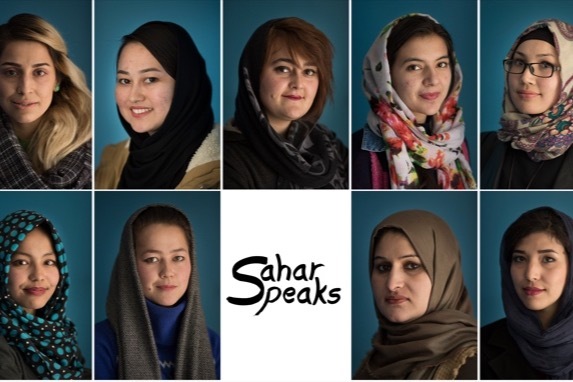 Sahar Speaks was established in 2015 in response to the appalling lack of Afghan female reporters working for the English-language, international press in Kabul. The situation for Afghan women in the current environment of increasing violence and insecurity is critical: it is vital we hear their voices going forward, and that they are properly supported. British-American journalist Amie Ferris-Rotman developed the program as a John S. Knight Journalism Fellow at Stanford University. Since 2015, we have held three rounds of training for Afghan female journalists in Kabul. We started out with text-based journalism before moving on to visual storytelling , publishing a wide range of stories in the Huffington Post. This collaboration marked the first time so many Afghan female reporters were published in a global media outlet. In 2017, three of our stories were adapted for the London stage, with Palindrome Productions, and there are plans for continued collaboration. In summer 2018, we began publishing our stories on the Guardian's Global Development site. The world wants to hear, see and read about Afghan women's lives, as told by Afghan women themselves. We need to support our hard-working cadre of journalists with continued training, mentoring and support placing their work in international publications. We are a tiny operation, so every donation goes really far. Thank you so much for your donations and support!